Example returned to the fore with the release of the first single, ‘Say Nothing’, taken from his soon to be released fourth album ‘The Evolution Of Man’. Earlier this year he sold out his first 14-date arena tour and recently announced a second round for 2013, this time 16-dates to showcase his ever-growing arsenal of hits. Now he prepares to release the second single, ‘Close Enemies’, from the new album, mixing candid lyrics with his chorus and darker beats. For the making of ‘The Evolution Of Man’, Example enlisted the help of Blur hero Graham Coxon who plays guitar on four tracks on the album, including hit single, ‘Say Nothing’. ‘Close Enemies’ received its first play on Radio 1 as Zane Lowe’s ‘Hottest Record’, the video was directed by Rankin, who was hot off the set from Azealia Banks’ ‘Liquorice’ and tells a dark tale of love and monsters. 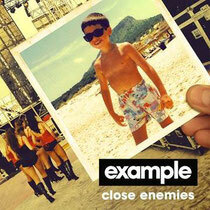 Ministry of Sound will release ‘Close Enemies’ on the November 11. ‘The Evolution Of Man’ will be released on November 18.